Congratulations to All Saints, Souldrop on this special anniversary, celebrating the Church's re-opening after re- building in 1861. The church was beautifully decorated with floral displays, together with a most interesting `Time Line' display, compiled after much research and effort by Margaret Caiger. This display with other items relevant to the Church's history will remain on display until the New Year. The weekend had a good start on Saturday evening 30th October with a relaxed and friendly cheese and wine event organised by Chalks Oliver. Friends from all three churches in the benefice and from Knotting attended it. At the choral communion service on the Sunday morning, it was wonderful to have such a full attendance with 75 communicants, together with inspired singing by Sharnbrook and Felmersham choir members. This service was followed by a well-attended 6pm `Songs of Praise' with a theme arranged by Margaret with appropriate hymns and readings reflecting the different stages of church events in our own lives, from baptism onwards. Our very grateful thanks are due to all those involved in the arrangements, the preparations for these celebrations and to all parishioners who attended them. Please join us a Souldrop again at any of our weekly services. Click this link ‘Report on Church Rebuilding’ to see the newspaper article on the Church re-opening in 1861. The Following Description and History is taken from Notes prepared by Chris Pickford (Bedfordshire County Archivist) for the Victorian Society tour of Bedfordshire - 30th. May 1992 Souldrop, situated on the north Bedfordshire wolds, was an outlying part of the Duke of Bedford's estate. The present church, and its predecessor, owed much to the patronage of the estate, although the village also came under the influence of the Magniac family of Colworth House, near Shambrook, who owned the other half of the parish. The present church at Souldrop is chiefly Victorian, but its unbuttressed west tower is of C. 1275, and has a contemporary broach spire with two tiers of lucames. According to Pevsner, it is the oldest spire in the county. The building has had an unfortunate history. According to contemporary accounts, the old church fell into decay in the eighteenth century. The roof collapsed in 1795 and in 1799 the parishioners obtained a faculty to rebuild. A new church (nave and chancel) was erected with reading desk, pulpit, pews and commodious open seats. It was opened for divine service on Trinity Sunday 1800. "Mr. Robert Salmon, Surveyor to the Duke of Bedford, furnished the Plan and estimate gratuitously", and the Rev. John Whitehouse, then Vicar of Sharnbrook, painted the altar piece, representing Jacob's Ladder. This was said to have been a copy from some great master. Salmon's plan, together with various other papers about the rebuilding, is now preserved at the Bedfordshire County Record Office. There exists also an attractive water colour (Click picture on right) illustrating the appearance of the 1800 church, which was rather a mean structure built on a tight budget. 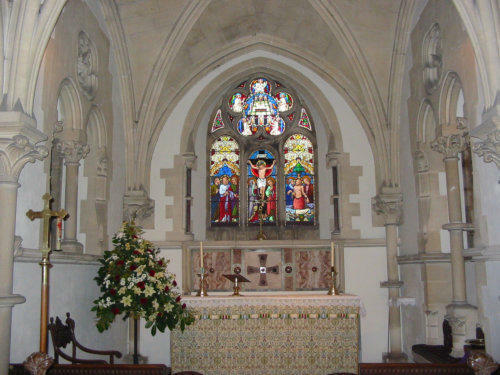 Not unusually for the period, it had a short chancel with a false east window - described in 1854 in a series of pithy articles about Bedfordshire churches as "entirely closed". Of the interior, the same writer commented, "It abounds in high deal pews, most probably after the pattern which decorate the fanner's cattle stalls; with a limited number of open sittings; abundantly covered with lime wash; and plenty of hooks to save the hats of the congregation from its contamination". The writer of these articles was John Martin, a campaigner for the ecclesiological cause, whose nom de plume "W.A." provided almost transparent protection for his real identify. The initials represented Woburn Abbey, where Martin was employed as librarian to the Duke of Bedford. Under Francis, the 7th Duke, the Estate was actively engaged in the 1850s on an ambitious building programme, which included rebuilding farms, the provision of labourers' cottages and schools, and improvement to churches. With all these influences in the wings, the rebuilding of Souldrop church was inevitable and the moment came soon after the appointment of a new Rector in 1856. The Rector at the time of rebuilding was the Rev'd George Digby Newbolt, whose diaries covering the period of the restoration have been edited by Patricia Bell in "Some Bedfordshire Diaries" and published in BHRS Vol. 40 (1960) pp 200-225. In his account of the year 1860, Newbolt wrote: "In 1860 the Duke of Bedford consented to rebuild the church, on the condition of the Rector being answerable for £500 to build the chancel. The last service in the old Church took place on the evening of Sunday February 5 (Septuagesima Sunday 1860) and the work of taking down the building commenced the following morning. The first stone was laid (without any ceremony) on Easter Tuesday April 1 0 in the same year, Henry Clutton, Esq., 9 Burlington Street, London, being the architect. Divine service during the rebuilding. of the Church took place in the Rectory Barn under License of the Lord Bishop of Ely ....... On Tuesday October 2nd. I, G. Digby Newbolt, Rector, placed the Key-Stone of the East Window of the new Church ...... .. His diary the following year includes a list of gifts to the new church, and a touching note recording that on 30th September "the Font was laid by my little girl, Augusta Mary, aged 41/2". 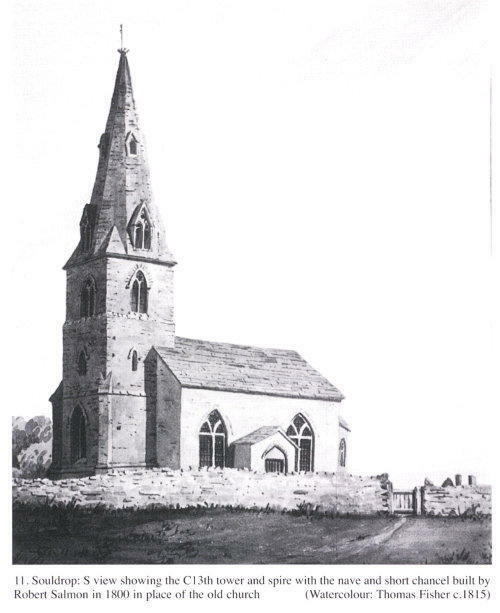 The Church was opened on Tuesday 17th December 1861, accounts of the service being published in all the local papers. The glass in the east window is contemporary with the rebuilding. The diaries record the completion of the glazing scheme in the chancel, including the Rose window above the organ, between 1865 and 1869. All the glass of this period was designed by O'Connor of 4 Bemers Street, London, and largely paid for by surplice fees and Harvest thanksgiving collections. Bills in the Bedford Estate archive show that Bath stone as used for dressings; the hot water heating apparatus was supplied by Packham & Son, Brighton (£71); Thomas Earp was responsible for the stone and wood carving (nave, font and pulpit £30-19s; chancel £58); the chancel pavement is by Maw & Co., Benthall Geometrical Mosaic Works, Broseley (£19-7s); and cathedral glass for chancel came from Watson & Co., of London. Writing some ten years after it was built, W.M. Harvey in his "The History and Antiquities of the Hundred of Willey in the County of Bedford" (1872-8) p. 452, described the church as "........ of a substantial and handsome character; it is the work of Mr. Clutton, the well known architect, and was built at the cost of the Duke of Bedford, the chancel principally by the Rector. Much of the stone with which the church was rebuilt came from the neighbourhood. It has a stone groined roof, and contains some fine specimens of stone carving by Earp of London; the organ is by Walker. The east window is filled with stained glass." By 1860, Clutton had carried out other work in the county, mainly for the Duke of Bedford. The new church at Steppingly (1859-60) had been his most important Bedfordshire commission. At Souldrop we see an early example of his French Gothic style, later developed further in the new church at Wobum (1865-8). The nave is very dull and functional in contrast to the rich chancel with its fine vaulted ceiling and carved capitals, enriched by O'Connor's excellent glass. Clutton later designed the former village school at Souldrop, built in 1867-8.